All our products: slippers, sandals, shoes and boots are designed and made to be as close to barefoot walking as possible. Our products lack hard and stiff elements; the sole (leather or rubber) is sufficiently thin, lightweight and elastic. The overall design of our products is flexible and lightweight, so as not to prevent the child's foot to feel the terrain and not restrict its movement to develop properly and fully. It is better for toddlers to start walking barefoot or with a shoe with a soft or thin sole that is flat and elastic. This is the natural way the feet develop. The foot of the baby consists of cartilage which in time transforms to bone. The moment the ankles and the feet are ready to take on the weight of the body, the toddler starts to walk. It is crucial for the proper development of the muscles and the tendons of the feet that all parts of the foot are involved in the process. In other words, they should not be restrained by isolating them with a hard sole, hard or strengthened heel or toe area. When toddlers walk barefoot or with a thin (up to around 6mm) and elastic shoe, the feet can feel the terrain. This way, the foot of the toddler develops naturally, the nerve endings send proper signals to the brain and the brain can properly distribute the body weight in every step. When the shoes are not adapted to the development stage of the foot, when they are heavy or made from artificial materials with thick soles, they are dangerous to the proper development of the spine because the feet bear the entire body weight. Furthermore, this can lead to anomalies in the feet and other problems as the child grows up. The thicker the sole the more muffled the signals send from the nerves to the brain. Barefoot walking always leads to better coordination (toddlers do not look to the ground because the feet can feel the ground), proper development of the muscles and the tendons; it helps the formation of the arch and straightens the gait. The shoe is designed simply to protect the feet from the external environment and from injuries. The shoe must not deform the foot by restraining it; it must not prevent it from feeling the ground. The shoe must not cause injuries. 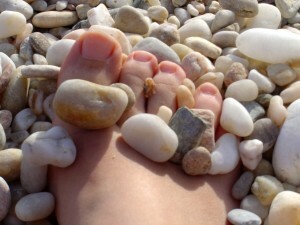 That is why the kids should always walk barefoot when possible or with shoes that achieve to imitate barefoot walking.